dries nail polish in 60 seconds! express dry drops has a rating of 4.9 stars based on 21 reviews. show us by tagging @essencemakeup in your post! Sometimes every second counts. 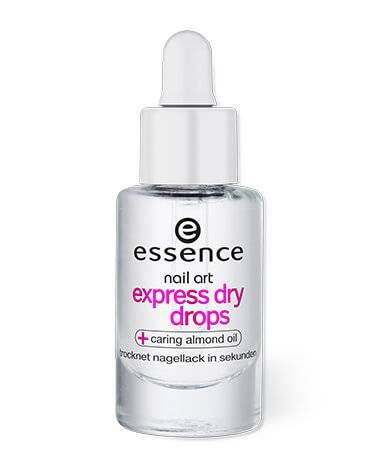 With express dry drops, nail polish dries in 60 seconds! The fast-drying formula includes vitamin E and almond oil to nourish nails and cuticles. CYCLOPENTASILOXANE, DISILOXYNE, DIMETHICONE, PRUNUS AMYGDALUS DULCIS (SWEET ALMOND) OIL, TOCOPHERYL ACETATE.